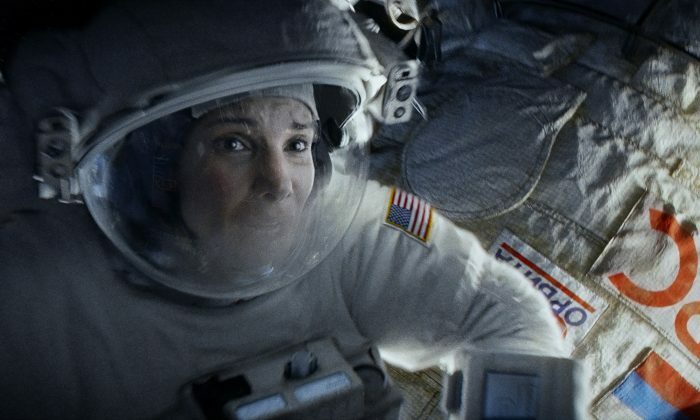 NEW YORK—Little did Academy Award-winning actress Sandra Bullock realize that the dramatic sci-fi thriller “Gravity” rested entirely on her emotional performance. “I never thought, ‘I’m the only person on-screen,’” Bullock said in a recent press conference. “Gravity” centers around two astronauts who, while on a seemingly routine spacewalk, face a disaster and have to fight for their survival in the void of outer space. Bullock plays Dr. Ryan Stone, an engineer on her first shuttle mission. George Clooney co-stars as veteran astronaut Matt Kowalski. “I’m always longing to do emotionally and physically what my male counterparts always got to do. I felt envious every time I saw a movie that I was in awe of, and it was usually a male lead,” she said. Academy Award-nominated director of many notable titles like “Harry Potter,” “Children of Men,” and “Paris, Je T’aime,” Alfonso Cuarón worked with his older son Jonás Cuarón on the script. They specifically wrote the lead role for a woman, which Bullock found revolutionary. “Those kinds of roles weren’t available … in the last couple of years things have shifted,” Bullock said. Alfonso Cuarón calls the story a metaphor of a typical survival story. “It’s a film about a woman that is drifting into the void,” he said. A woman who’s drifting in her own bubble further and further away from human connection, into adversity, with a longing to survive. The survival aspect, however, is what makes the film emotionally charged to an extreme where the character’s emotions become the driving force behind the sounds, music, and technical details in every scene. “[Emotion] was the big hanger; all the big elements started to hang from that core,” Alfonso Cuarón said. Although there was a lengthy process of training for the actors on how the body behaves at zero gravity, there had to be an even more challenging process to prepare for the emotional roller coaster. “It made you realize, ‘I have to step up and be the best version of myself so that whatever’s asked of me, I can produce,’” Bullock said. Producer David Heyman said at the conference that Bullock was not only able to enact the deep emotions through her character, but she also told the whole story with her eyes. “And those eyes are behind a visor,” he said. When Bullock watched the movie for the first time, she was swept away with the film, saying that for the first time in her career, she was able to watch it like a newcomer would. “You were inundated with the extreme emotion and beauty that [Cuarón] created visually,” she said. Contrary to tradition, the sound engineers, designers, and cinematography crews worked in unison toward achieving the desired effect of portraying an intense emotional journey. “It was a very holistic process for all of us,” Cuarón said. Bullock said the collaboration was an experience unlike any other. “There was a level of kindness and collaboration, and the general sense of the unknown bonded everyone together on such a human level,” she said. Critics have praised the 49-year-old actress—typically known for her characters’ awkwardness, quirkiness, and blunt manners—for her intense performance in “Gravity.” The film is already part of the early Oscar buzz and will be opening in theaters across the U.S. this Friday.